We cover the counties of - Anglesey - Gwynedd - Conwy - and the whole of the North Wales. 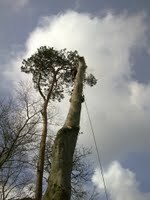 We are a highly skilled family run team of tree surgeons who have been operating in North Wales and beyond for over thirty years, undertaking all aspects of tree surgery from highly technical dismantling operations to aesthetic tree pruning and crown reshaping. We are approved by all local authorities and contract to many of the botanical gardens and estates in the region. As well as having many domestic and commercial customers who continue to employ us for maintaining their trees and hedges. We can also recycle the products of tree works in various ways - for timber, planks and beams, firewood, split logs, wood-craft, habitat management, wood-chip, mulch or anything else. We don't believe in wasting the by-products of our operations wherever possible. Also, we carry out Surveys and Reports for Arboricultural advice and information, including recommendations (and detailed technical explanations if required). Fully insured - with no claims against us, ever! - We operate in a friendly and professional manner and have a value for money policy, so at the end of a job we are all satisfied. Contact us now to discuss any work you need doing and we will arrange for a site visit to give you a free quotation. Phone 07427 660118 and speak to Phil.